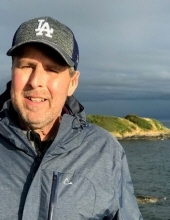 After a courageous 7 year battle with cancer, Bradley Kent Anderson of Post Falls, Idaho was summoned home by his Heavenly Father on January 27, 2019. He was born on May 11, 1968 in Fontana, California. The third of eight children, he attended public schools in Turlock, California, graduating from Turlock High School in 1986 and graduated from the University of Idaho in Career and Technical Education. Brad was an active member of the Church of Jesus Christ of Latter-day Saints and served an honorable two-year mission in Rio de Janeiro, Brazil (1987-1989). He met his wife, Annie, in 1990 while they were attending Brigham Young University in Provo, Utah. On June 6, 1991, the couple was married for eternity in the LDS temple in Salt Lake City, UT .They enjoyed a wonderful and fulfilling marriage. To this devoted couple were born four precious children: Greyson, Easton, Noah and Trinity. After living in Provo and Sandy, Utah, and Meridian, Idaho, the family found their home, Post Falls, in 2004. In Post Falls, Brad found his passion, his “calling” and genuine fulfillment in the field of Education. He was blessed to receive the position as a shop teacher at the Post Falls High School and later, a teacher at the Post Falls and River City Middle Schools. While working in the Post Falls School District, he developed a genuine love for his students and fellow teachers. His fellow teachers and staff helped sustain him, emotionally and physically, through his last days. He loved to see his students find success both in his class and in life. His dedication and caring nature were reciprocated in a number of ways, such as through his awards as Teacher of the Year at both middle schools (2017). An additional meritorious award included his recognition as an “Honorary Teacher of the Kamehameha School” In Hawaii (2018). One of his greatest personal honors and accomplishments over the years was in assisting over one-hundred Pinewood Derby participants build their cars. Brad found fulfillment serving his family as well as his community. Even while suffering extreme pain and weakness during the last days of his life, he continued to teach his students as well as fulfill his demanding church responsibilities as First Counselor in the Bishopric (Assistant Pastor); and this he did without complaint. He enjoyed the simple pleasures of life and spending time with his family. Extremely bright, he could fix or make anything; his willingness to provide support, advice, and ability to love others were only a few joys of meeting Brad. His life’s legacy—articulated through both his words and actions—includes the following words of counsel: cherish your family and keep it united; and finally, forgive, serve and love others unconditionally. Bradley Kent Anderson is survived by his wife and four children, parents Robert and Susan Anderson, forty-one nieces and nephews, and his seven siblings: Kellie Draper, Julie Nemelka, Terry Anderson, Heather Lee, Ryan Anderson, Maren Nielsen, and Jared Anderson-Bussiere. In lieu of flowers, please donate to Post Falls Middle School or River City Middle School. Please contact L. Wilhelm at (208) 773-7554 or Lwilhelm@sd273.com for instructions. A funeral service will be held at 11:00 AM on Saturday, February 2, 2019 at the Church of Jesus Christ of Latter-Day Saints, 2150 E. 16th Avenue, Post Falls, ID 83854 with a graveside following at Evergreen Cemetery, Post Falls, ID. To send flowers or a remembrance gift to the family of Bradley Kent Anderson, please visit our Tribute Store. Burial at Evergreen Cemetery will follow the funeral service. "Email Address" would like to share the life celebration of Bradley Kent Anderson. Click on the "link" to go to share a favorite memory or leave a condolence message for the family.